CARACAS, Venezuela—Venezuelans headed into uncharted political waters Jan. 24, with the young leader of a newly united and combative opposition claiming to hold the presidency and socialist President Nicolas Maduro digging in for a fight with the Trump administration. Violence flared during big anti-government demonstrations across Venezuela on Jan. 23, and at least seven protesters were reported killed in the escalating confrontation with Mr. Maduro, who has been increasingly accused of undemocratic behavior by the United States and many other nations in the region. “We know that this will have consequences,” Mr. Guaido shouted to the cheering crowd, then slipped away to an unknown location amid speculation that he would soon be arrested. Mr. Maduro fired back by breaking diplomatic relations with the U.S., the biggest trading partner for the oil-exporting country and ordering American diplomats to get out of the country within 72 hours. Washington said it would ignore the order. Some Russian officials reacted with anger to the opposition protests. Alexei Pushkov, chairman of the information committee at the Russian Federation Council, called Mr. Guaido’s declaration “an attempted coup” backed by the U.S.
Russia has been propping up Maduro with arms deliveries and loans. Mr. Maduro visited Moscow in December, seeking Russia’s political and financial support. Over the last decade, China has given Venezuela $65 billion in loans, cash and investment. Venezuela owes more than $20 billion. On Jan. 24, attention shifted to Washington, where diplomats at the Organization of American States held an emergency meeting on the Venezuelan situation. Meanwhile, many Venezuelans will be looking for Mr. Guaido to re-emerge and provide guidance on the opposition’s next steps. Several generals, each standing behind rows of green uniformed officers, appeared on state television early Jan. 24 to profess their loyalty to the embattled president. The price of oil slipped for the third time in four days Jan. 23, an indication that international energy markets are not overly concerned yet that the situation in Venezuela—America’s third top oil supplier and owner of Houston-based Citgo—will disrupt global crude supplies. Tensions began ramping up on Jan. 10 as Mr. Maduro took the oath of office for a second six-year term won in an election last May, that many in the region contend was not free or fair, partly because his strongest opponents were barred from running. 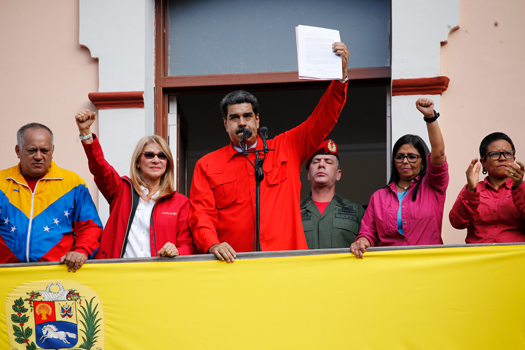 He escalated his campaign Jan. 23 by declaring that the constitution gives him, as president of the congress, the authority to take over as interim president and form a transitional government until he calls new elections. The assault on Mr. Maduro’s rule came after large crowds gathered in Caracas waving flags and chanting “Get out, Maduro!” in what was the biggest demonstration since a wave of unrest that left more than 120 dead in 2017. There were no signs that security forces heeded Mr. Guaido’s call to join the anti-Maduro movement and go easy on demonstrators. Hours after most demonstrators went home, violence broke out in Altamira, an upscale zone of Caracas and an opposition stronghold, when National Guardsmen descended on hundreds of youths, some of them with their faces covered, lingering around a plaza. Popping tear gas canisters sent hundreds running and hordes of protesters riding two and three on motorcycles fleeing in panic. Amid the showdown, all eyes are on the military, the traditional arbiter of political disputes in Venezuela—and to which Mr. Guaido has been targeting his message.